This Saturday is Pi Day so it’s time to celebrate! Never heard of Pi Day, have no fear. It’s a less known day, March 14th or 3.14 which represents the first three digits of Pi. This year is a once in a hundred year event since 3.1415 are the first five digits. Eat your pie at 9:26:53 and we have it all the possible digits in one day of 3.141592653 (if you recall your math lessons Pi goes on forever but the times of a day don’t)! It’s a day to promote the study of mathematics, or better yet an excuse to eat pie! Feel free to recite as many digits of Pi as you can while eating your pie! This is the recipe I mentioned in the last In My Kitchen post, the boys’ first cooking lesson. Sean and I made it again, you know, all for the sake of getting photographs and posting it. It was a hardship to eat it! Chess pies are found often in the South. 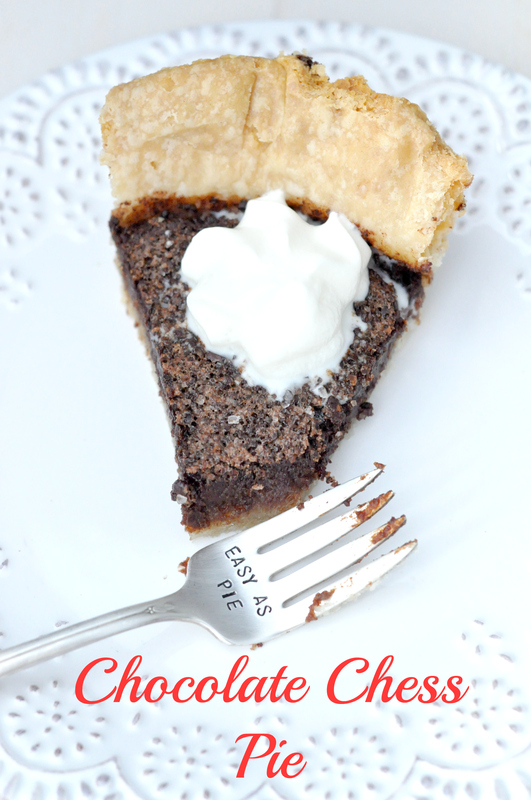 I grew up in Wisconsin where we never had chess pie, but when we went to visit my aunt and uncle in Virginia we always had this chocolate chess pie. This is their recipe, one I’ve had for as long as I can remember. The only change I made was to add vanilla sea salt to the top, I just love salty and sweet together. 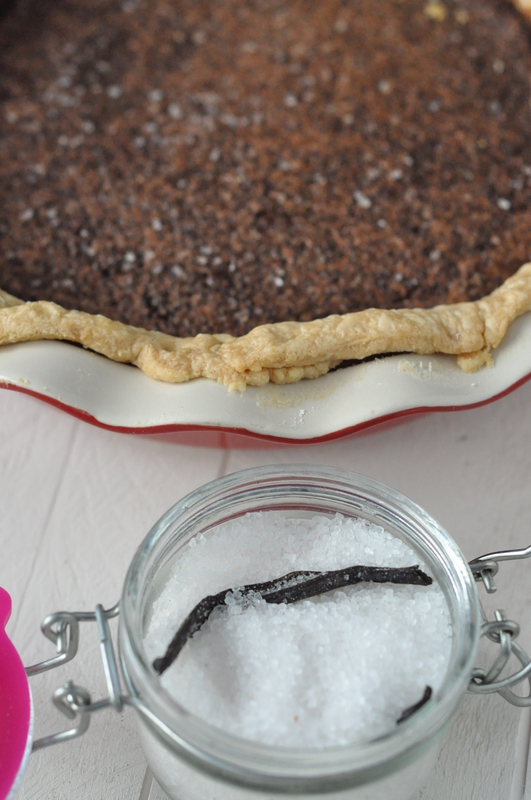 This pie is fudgy and the salt was a nice compliment. This is such an easy pie to make, the hardest part is the crust. This crust recipe uses a food processor so it isn’t extremely difficult. My grandma was a master of crusts, but I am still learning. I need to find her recipe, though I do recall her’s used a splash of vinegar. The good news is that this crust will still taste great, even if your pie edging skills aren’t mastered yet! My aunt and uncle always make at least two pies at a time, they may live alone but they feed the whole neighborhood! To make it even easier and portable for a potluck meal you could certainly use store bought crusts. For the crust combine the flour and salt in a food processor and pulse for a second to combine. Add the butter and pulse about 10 times, until it looks the size of very small peas. With the machine running add the water until the dough comes together, be careful not to overprocess or it won’t be flaky. Take the dough out and place in a ball on plastic wrap, cover and put in the fridge for 30 minutes. Preheat oven to 350 degrees. Roll the chilled dough out on a floured surface to fit your pie pan. Place it in the pan, pinch the edges or finish the edges your favorite way and cover with foil. Add pie weights (or dried beans) and bake for 20 minutes. Remove the foil and weights, prick all over the bottom with a fork and bake for another 10 minutes. For the filling whisk everything together in a medium sized bowl and pour into the prepared crust. Bake the pie for 15 minutes, at this time a slight crust has formed on the filling so sprinkle on the sea salt. Bake for another 25 minutes. Allow to cool completely before serving. 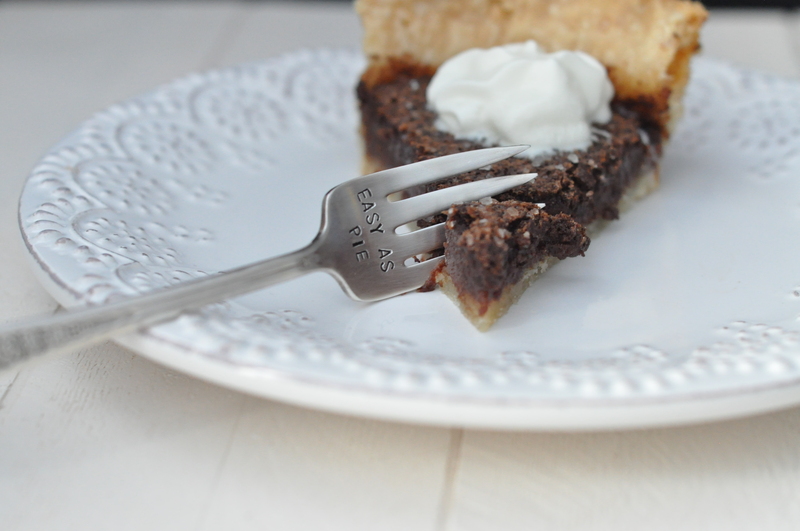 This entry was posted in Pies and Tarts and tagged chess pie, Chocolate, Dessert, easy, fudgy, vegetarian on March 10, 2015 by Gretchen. I love this pie, it looks awesome!! I make this one a lot, my entire family loves it too!! I’ll send you a virtual piece tomorrow for Pi Day! Happy Pi Day! I can get behind that! I am from the South and have sadly never tried a chess pie. A special and delicious treat for your family! Your crust looks so flaky and perfect. Thank Shanna! I have a love hate relationship with crusts! I finally have them flaky and great tasting, just not always so pretty looking! nom! Have never known what exactly is in chess pie. This looks fantastic and classic. Thanks Liz! It is definitely a family favorite! Of course I also enjoy lemon chess pie too…. Thanks for popping by! It is certainly a delicious pie.